I am using ROCR package and i was wondering how can one plot a ROC curve for knn model in R? Is there any way to plot it all with this package? There's several steps to solve in order to get you a ROC curve here. I am just going to make up some data since you did not provide an easy way of getting the data you are using. Note that the ROCR package wants the class labels to be positive/negative, not factors, so let's make them like that. You can now train your knn and obtain its class probabilities from the "prob" attribute. # but for some reason it did not work for me. However, they come on a form that ROCR does not accept so we need to invert them for the -1 class and rescale them. 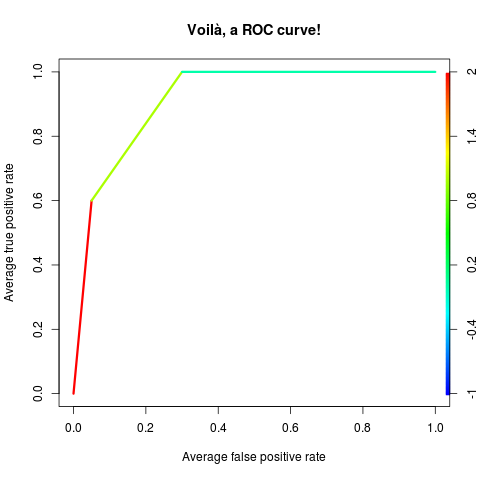 Now you can feed the "probabilities" into the ROCR package's functions and obtain a ROC curve. This line would work just fine, but according to the documentation, both the arguments must be vectors. Note: ROCR only supports binary classification. So check if the levels in 'knn_isolet$y' and 'isolet_testing$y' have the same labels. Not the answer you're looking for? Browse other questions tagged r knn roc or ask your own question. How to plot different ROC curves with different symbols on the line using ROCR package?